Class Communications: You will occasionally receive class information via email to your prism account. Because this information may not be communicated in class, you should be sure to read messages identified as [EQ Physics]. In emailing us for class, please add [EQ Physics] to the subject line and identify yourself by name in the message since not all prism accounts clearly identify the email's author. Your course grade will be based on three criteria: exams (35%), discussion (40%), and project (25%). Exam: There will be one one exam covering all material presented during the lecture portion of the course. If you are having difficulties understanding topics, please discuss this with us outside of class, when it arises. Do not expect to do well by cramming just before the exam. 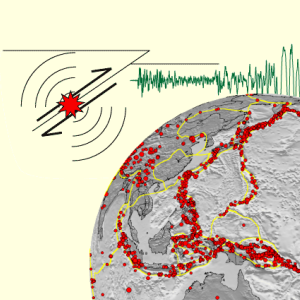 Discussion: Approximately half of this class will be comprised of detailed discussion of five topics of modern research in the field of earthquake physics (listed in the course outline). Before each discussion, you will be expected to read the assigned papers and submit (electronically) a 2 page summary of the topic. After discussion is completed on that topic, you will submit a new 4 page synthesis of your understanding of the current state-of-the-art of that topic. Discussion comprises 40% of your total course grade and is based on pre-discussion topic summaries (15%), post-discussion syntheses (15%), and in-class participation (10%). 4) perform an appropriate unique physical analog or unique computational experiment to test hypothesis. Your final project will be written up in journal form suitable for Geophysical Research Letters (GRL), and will be presented in a 15 minute AGU-style talk (12 minute presentation with 3 minutes of questions). For guidelines on document preparations for GRL submissions go to http://www.agu.org/pubs/au_contrib_rev.html. Your project comprises 25% of your total course grade and is based on the quality of the paper (10%), presentation (10%), and in-class participation (5%). General: It is expected that all students are aware of their individual responsibilities under the Georgia Tech Academic Honor Code, which will be strictly adhered to in this class. Topics Papers and Project: Pre-discussion summaries, post-discussion syntheses, and Project papers, are expected to be the original work of the individual student. Hence, any papers that appear overly similar will be investigated and appropriate actions will be taken, if necessary. Likewise, Plagiarism is strictly forbidden. Plagiarism is the act of appropriating the literary composition of another, or parts of passages of his or her writings, or language or ideas of the same, and passing them off as the product of one's own mind. It involves the deliberate use of any outside source without proper acknowledgment (as defined by the Georgia Tech Academic Honor Code). Exam: All information required for exams will be supplied. Reference to texts or other documents during exams is strictly forbidden. The use of electronic devices (e.g. cellular phones, computers etc.) other than non-programmable calculators during exams and quizzes is not allowed. The complete text of the Academic Honor Code may be found at http://www.deanofstudents.gatech.edu/integrity/policies/honor_code.html.